« Grape Juice or Wine for Passover? Rabbi Yosef Berger, the rabbi in charge King David’s Tomb on Mount Zion, revealed to Breaking Israel News a 600-year-old Jewish source stating that the Third Temple will be prepared by descendants of Edom as a “reparation” for destroying the Second Temple. Additional hints from esoteric sources indicate that US President Donald Trump has already begun this process. Citing Midrash Rabba, a collection of homiletic teachings believed to have been compiled in the fifth century in Israel, Rabbi Berger explains this apparent redundancy by stressing that the four animals are compared to the four major kingdoms that mistreated Israel. Of these impure species, a chazir is compared to the nation of Edom, which literally translates as ‘red,’ referring to the redness of Jacob’s brother, Esau. In Rabbinic literature, Edom refers to Rome, which largely comprised of Esau’s descendants. Edom has also come to mean Christianity which first flourished in Rome. Rabbi Berger emphasized that these sources state explicitly that the Third Temple will be built by the descendants of Rome, i.e. Christianity. Let me state here that biblical references to Edom are NOT references to Christianity. Edom has to do with the Turkish peoples (see Turkey in Prophecy). The Jews really do not believe that Turkey is about to build a temple for them, so this rabbi is wrong on this. Furthermore, while the destruction of the temple by the Romans was prophesied in Daniel 9:26, there is no scripture that states that before the Messiah comes that the Romans will rebuild the temple. Is poured out on the desolate (Daniel 9:26-27). The above is referring to a deal or covenant that has a time element attached to it. In a sense, this numbered deal could be considered an end time “handwriting on the wall” (see also Can those in the USA/UK see the Handwriting on the Wall?). The ‘one week’ time element has generally been understood by prophecy watchers to mean a seven year deal (2520 days, based on prophetic 360 day years), that will be broken in the middle of it (after 3 1/2 years). The Hebrew word translated as “week” literally means “sevened” (OT:7620 literal, sevened. Biblesoft’s New Exhaustive Strong’s Numbers and Concordance with Expanded Greek-Hebrew Dictionary. Copyright © 1994, 2003, 2006 Biblesoft, Inc. and International Bible Translators, Inc.). The ‘with many’ referred to in Daniel 9:27 indicates that ‘many’ nations, as opposed to one or two, are agreeing to something. In the 21st century, the European Union includes much of the land and peoples that were part of the ancient Roman Empire. And it is the “prince” coming from that people that verse 27 of Daniel 9 is referring to. Thus, this prophecy tells us that a lower level European leader will somewhat officially start to rise up about 3 1/2 years before the great tribulation (and yes, according to Jesus, some “tribulation” does happen prior to the start of the Great Tribulation). Another is the fact that the “beast of the sea” of Revelation 13:1 fits with the beasts from the “great sea” of Daniel 7:2–and that sea is the Mediterranean Sea according to the Old Testament. Hence a power in Europe is the only region that could have an empire geographically like the old Roman one (for more details, please see Europa, the Beast, and the Book of Revelation). This is not an Arab empire, like some incorrectly claim (see also Can the Final Antichrist be Islamic?). Consider that it is a ‘prince’ who takes away the daily sacrifices in Daniel 9:27, and that he is also called the King of the North (Daniel 11:40) who stops the sacrifices in Daniel 11:31. So, we see several references to an end-time ‘Roman’ power that will STOP sacrifices, but none that he will build another temple for the Jews. Because of Donald Trump’s decision related to moving the US Embassy to Jerusalem, some think this will make it easier for a ‘Third Temple’ to be built there and that Donald Trump is the biblical ‘Cyrus’ (see Donald Trump reportedly a ‘Cyrus’ preparing the way for a new Jewish temple). That view is not limited to Protestant groups. Study your Bible together with this last unedited book Mr. Herbert W. Armstrong wrote, ISBN 0- 396-08773-6, and please wake up! 8 “Remember this, and show yourselves men; Recall to mind, O you transgressors. Donald Billingsley has many prophetic misunderstandings. Now, I have been aware that many Protestants have considered that Donald Trump was a type of modern Cyrus–essentially a non-believer that God would use to do things. In Donald Trump’s case, to reduce abortions, overturn the LGBTQ agenda, etc. Actually, in March of last year Donald Trump did attribute a quote to Cyrus the Great (see Donald ‘Trump of God,’ Cyrus, or Apocalyptic?) which, at least in my view, he was trying to make the Cyrus connection that he must be aware that others have claimed him to be a type of. But I do not consider this to be a biblical Church of God position–but Alton Billingsley has a different view (see also CGFF claims Donald Trump is a ‘Cyrus’ who will lead to the ‘Third Temple’). Many evangelicals believe that Donald Trump is ushering in the end times (watch Evangelical support for Donald Trump’s Jerusalem policy). Certain Jews have even put him on a commemorative coin with Cyrus (see Sanhedrin Mints Silver Half Shekel With Images of Trump and Cyrus: Is the ‘third temple’ necessary for a successful Trump presidency?). Regular readers of this COGwriter Church of God News page are aware that I have written for years that Donald Trump was ‘apocalyptic’ (watch also Donald: ‘Trump of God’ or Apocalyptic?). But that does not mean that Donald Trump is fulfilling a ‘Cyrus’ prophecy or that he will get Edom to build a new temple. There has been much perplexity and discussion as to when the temple will be built to which Christ shall come. Malachi’s prophecy speaks of Christ’s second coming to His temple (Malachi 3:1-6). In Haggai’s prophecy it is referred to prophetically. Zerubbabel has been sent as governor of a colony to build the second temple 70 years after the destruction of Solomon’s temple. He built the temple to which Jesus came, though it had been enlarged and embellished by the Roman Herod. But speaking of this temple, as a type and forerunner of the temple to which Christ shall come at His second coming , it is written, “The glory of this latter house shall be greater than of the former, saith the ‘ Lord of hosts: and in this place will I give peace, saith the Lord of hosts” (Haggai 2:9). It is inconceivable that the Israelis, in the present international turmoil over their possession of old Jerusalem, could ever demolish the Arab Moslem Dome of the Rock – now on the site of Solomon’s temple-and build a new one there of greater splendor and glory than Solomon’s! However, as the second temple Zerubbabel was building was a typical forerunner of the temple to which Christ shall come, even so Zerubbabel was the typical forerunner of one Christ would use in building the far more glorious temple to, which Christ shall come in His GLORY! Zechariah 4:9 : “The hands of Zerubbabel have laid the foundation of this house; his hands shall also finish it . . .. ” And as Zerubbabel’s hands did finish that second temple, so shall the one Christ uses in building the temple to which He shall come in His GLORY! Various ones who profess Christ misunderstand about the temple in the church age. Christians are the temple of God according to the New Testament. Alton Billingsley is not being faithful to the Bible nor the writings of the late Herbert W. Armstrong as he often claims to be. That being said, Donald Trump’s Jerusalem embassy move does tie in with prophecy. 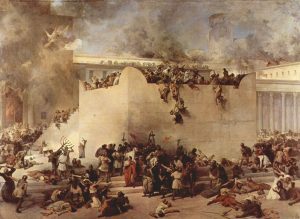 Partially because of his decisions, events will happen in Jerusalem that will one day result in sacrifices being resumed. But Edom is NOT about to build a temple. Evangelical support for Donald Trump’s Jerusalem policy BBC asked, “Why do US evangelicals support Trump’s Jerusalem policy?” BBC provided quotes from some believing it has to do with the ‘last days’ while others saying that is not the reason. Hal Lindsey’s book, ‘The Late Great Planet Earth’ is one of the sources pointed to. In this video, Dr. Thiel addresses scriptures related to Jerusalem as well as prophetic ones. He goes over the common ‘fig tree’ interpretation, belief about a ‘Third Temple,’ and statements about animal sacrifices. He explains biblical statements on those subjects as well as the views of certain modern Jewish organizations. This is a video. Jerusalem, Donald Trump, and Prophecy On December 6, 2017, US President Donald Trump fulfilled a campaign promise related to the recognition of Jerusalem as Israel’s capital. This brought anger, protests, and rockets from some Palestinians. It also brought condemnation from European allies–it has been claimed to be disruptive and even catastrophic. The Palestinian President (Mahmoud Abbas) said that this pronouncement eliminated the USA as being a fair mediator for a peace deal. Others have claimed that Donald Trump is an end time Cyrus and his pronouncement will lead to a Third Temple in Jerusalem. Is there ever going to be a peace deal? If so, will Europeans be part of it? Is Donald Trump a ‘Cyrus.’ Do the Jews require a Third Temple for sacrifices? Dr. Thiel answer those questions and more in this video. Does the Church of God need to be headquartered in Jerusalem? Some say so. But what does the Bible teach? A related short video is also available: Does the Bible endorse Jerusalem as the Church of God headquarters now? Church of God on Jerusalem’s Western Hill Could this building, often referred to as the Cenacle, which is located on a Mount Zion, possibly have been the oldest actual Christian church building? Does the ‘Cenacle’ deal have prophetic ramifications? After a 20 year negotiation, the Church of Rome has negotiated the right to have Catholic mass in the building known as the Cenacle. It is in the area where the Church of God on Jerusalem’s Western Hill once stood. This is believed to be the location of the earliest Christian church building. How does the Bible define the ‘temple of God’ in the New Testament? Could this be the area where the ‘man of sin’ will sit in the “temple of God’ that Bible prophecy discusses in 2 Thessalonians 2:3-4? This is a YouTube video. Turkey in Prophecy Do you know the Turkish people descended from? Did the Ottoman Empire possibly fulfill a promise in Genesis? Will Turkey support the European King of the North or Arabic King of the South? Will it betray one of them? Will Turkey be involved in the encouraging the destruction of Israel? Is Turkey going to become Catholic? Is Turkey mentioned in Psalm 83, Daniel 11, and elsewhere in the Bible? A related video is also available: What Should You Know About Turkey in Prophecy. Does the Church of God need to be headquartered in Jerusalem? Some say so. But what does the Bible teach? Location of the Early Church: Another Look at Ephesus, Smyrna, and Rome What actually happened to the primitive Church? And did the Bible tell about this in advance? Does God Have a 6,000 Year Plan? What Year Does the 6,000 Years End? Was a 6000 year time allowed for humans to rule followed by a literal thousand year reign of Christ on Earth taught by the early Christians? Does God have 7,000 year plan? What year may the six thousand years of human rule end? When will Jesus return? Continuing Church of God The group striving to be most faithful amongst all real Christian groups to the word of God. This entry was posted on Monday, March 26th, 2018 at 6:30 am	and is filed under Prophecy, Religious News. Temple Wall Found in Jerusalem?